Having toured with METALLICA, WHITESNAKE, ALICE COOPER, THE SCORPIONS, and many other artists since their inception in the early 80s, ARMORED SAINT has always been a highly regarded live act - not only in their hometown of Los Angeles, but also around the world. The only official release to capture this, however, is 1989's live album, Saints Will Conquer - until now. After reforming with their original line-up in 1999 (John Bush - vocals, Joey Vera - bass, Phil Sandoval - guitar, Jeff Duncan - guitar, Gonzo Sandoval - drums), and releasing subsequent albums, La Raza (2010) and Win Hands Down (2015), to critical acclaim, ARMORED SAINT has been delivering their heavy metal mastery around the globe, joining the likes of SAXON, METAL CHURCH - and even QUEENSRYCHE in November/December 2016 - on the road. Of all of these performances, the band recorded their 2015 Wacken festival set as well as their headlining show in Aschaffenburg, Germany, with the intention of giving fans another live release that holds up to Saints Will Conquer. In conjunction with PledgeMusic, this special live album is now available in various formats and bundles, with every "pledge"/purchase receiving a digital download of the tracks, plus exclusive behind-the-scenes content (including footage from Wacken 2015, plus 2016's Ozzfest and QUEENSRYCHE appearances, and more!). 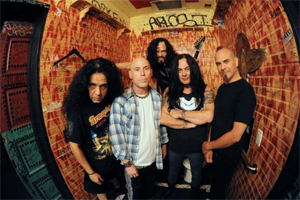 ARMORED SAINT comments: "Why PledgeMusic? Our fans have been extremely supportive over the years. We want to share the process of realizing this project with you by giving you the chance to be a part of it, from start to finish. How does it work? You place your orders here and when the album is released, you will get your items in the mail. But throughout the process, you will have access to the regular updates that we will post on this page." Pledge now and join the March of the almighty SAINT HERE.